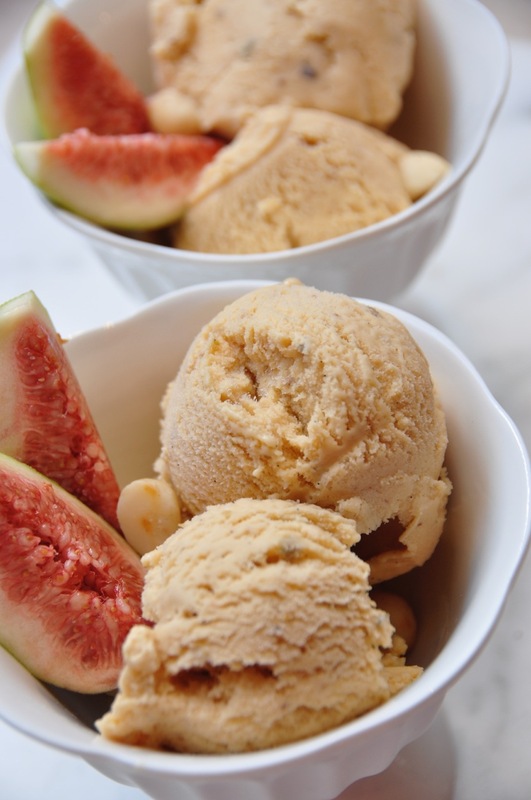 The combination of caramelized fig swirls, creamy ice-cream and roasted macadamia nuts, creates a delicious sun kissed ice-cream where the figs are the shinning star. 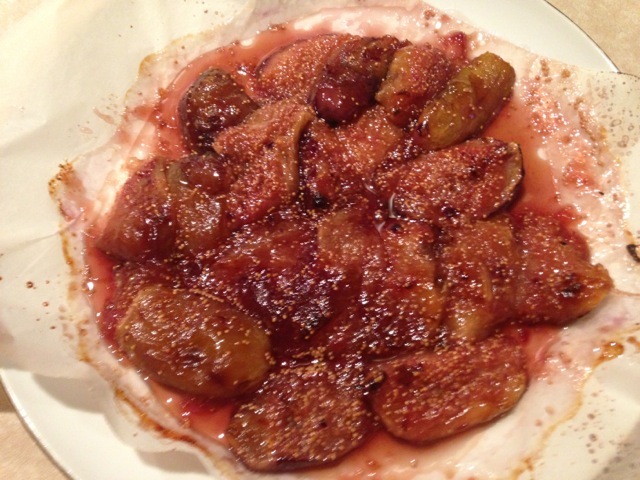 Roasting figs brings out their flavours and sweetness. Using a large saucepan, add in the milk, cream, vanilla bean and seeds and bring to a gentle boil. In the meantime, combine the egg yolks and sugar in the bowl of an electric mixer and whisk until the mixture has lightly thickened. Pour the milk mixture into a jug and remove vanilla bean. Slowly add the milk to the egg yolks (to avoid curdling the eggs) whilst the mixer is whisking at its lowest speed. Pour the combined mixture to the same saucepan along with the vanilla bean and return to a medium low heat. Stir constantly, scraping the bottom of the saucepan as you stir. Heat the custard until it thickens enough to coat the back of the spoon, approx. 5 minutes.Pour the custard into a heat proof bowl and cover with cling film. Refrigerate overnight. Cut off the steams of the fig. Using a wet cloth, clean the skin of the figs to remover any dirt. Cut figs into quarters. 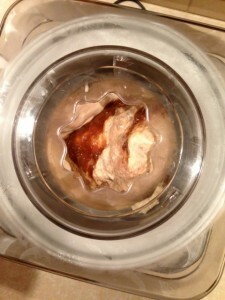 Combine honey and brown sugar in a bowl, add 2 tbspn of Vino Cotto to help breakup the mixture with a fork. Add the figs to the bowl and gently mix to coat them with the honey mixture. 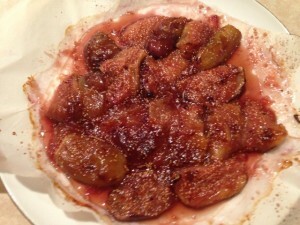 Scatter the figs into a lined oven tray and roast until they begin to caramelise, approx 25 to 30 minutes. Set aside to cool. Your kitchen will smell divine. 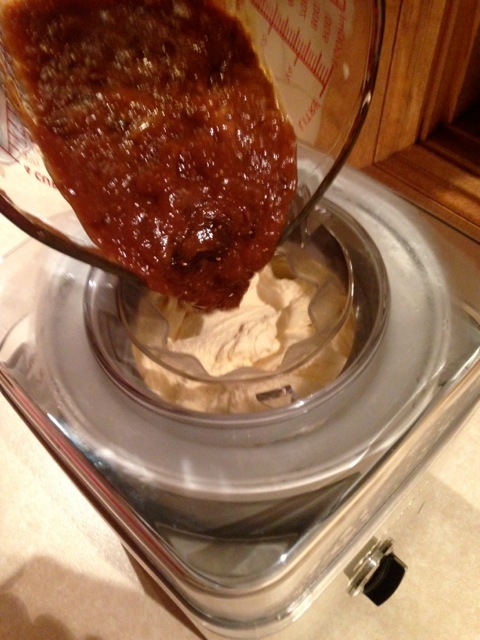 Once the figs have cooled, place the figs and any juices into a food processor or blender. Add the remaining 4 tbsp of Vino Cotto and process keeping some thick chunks of figs. Prepare the ice-cream maker as per manufactures instructions. 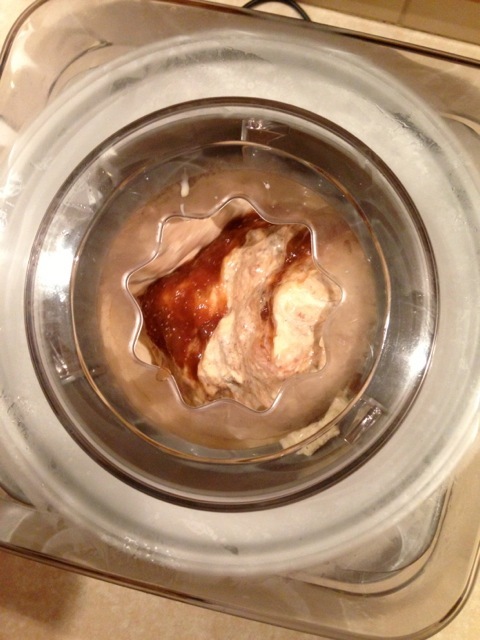 Strain the custard through a fine sieve into the ice-cream machine, discarding the vanilla bean. Chill as per manufactures instructions. When the ice-cream thickens and begins to form ice crystals, add the pureed figs and the roasted macadamia nuts. Allow to mix through until the ice-cream is set to your satisfaction. Pour the semi frozen ice-cream into a freezer safe container, cover and freeze for up to 4 hours before serving.